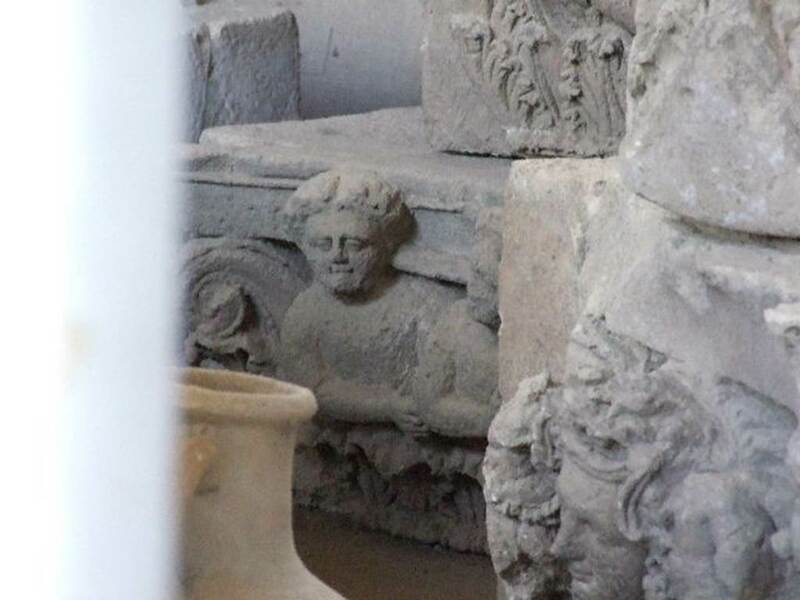 VII.7.29 Pompeii. Forum Holitorium, Foro Olitorio, Forum Venale, Horrea Granariorum, Grain market, Vegetable market, Granai del Foro, Granai Pubblici, Granaio, Poecile, School, Scuola. 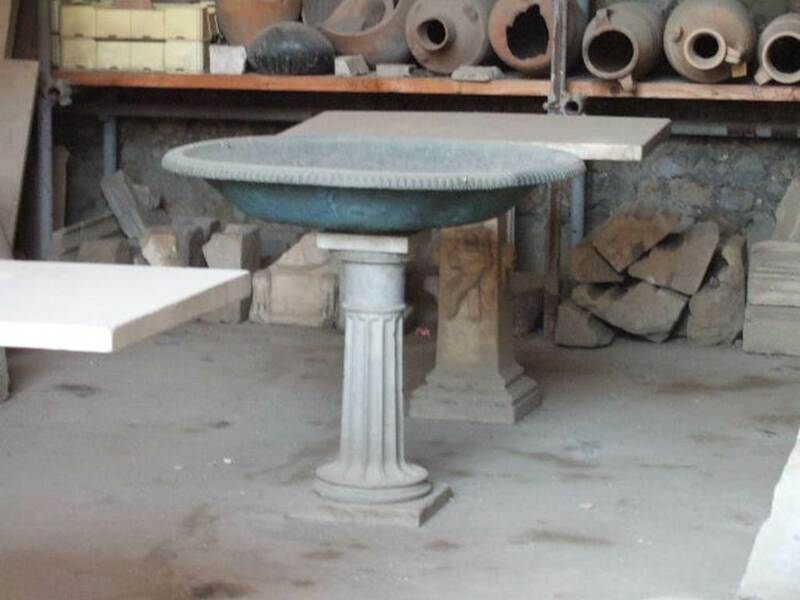 Now roofed and used as a deposito, a storage and display area. VII.7.29 Pompeii. May 2006. Items in storage. VII.7.29 Pompeii. December 2006. Items in storage. 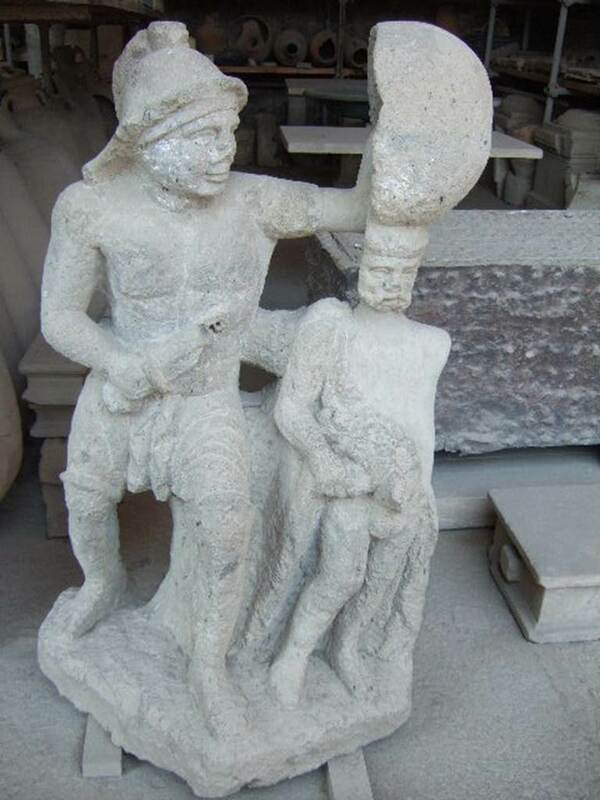 Statue of a gladiator with a sword and shield protecting another. 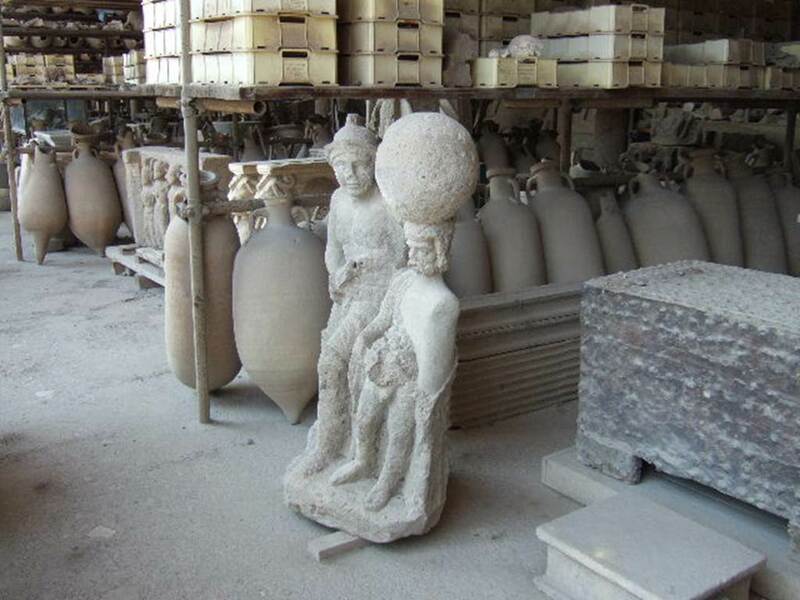 Found on a base near the triclinium of I.20.1 Inn of the Gladiators and vineyard. VII.7.29 Pompeii. May 2011. 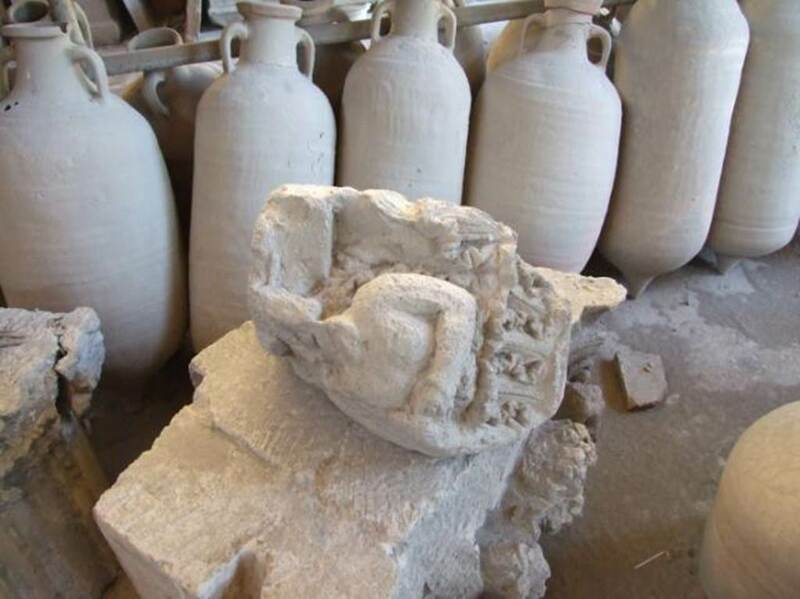 Plaster cast of body. Photo courtesy of Michael Binns. This man was found in 1889 just outside the Stabian Gate. He was described as lying on his back, wrapped in a cloak, and with his hands held as if protecting his chest. His legs were slightly bent. VII.7.29 Pompeii. October 2001. 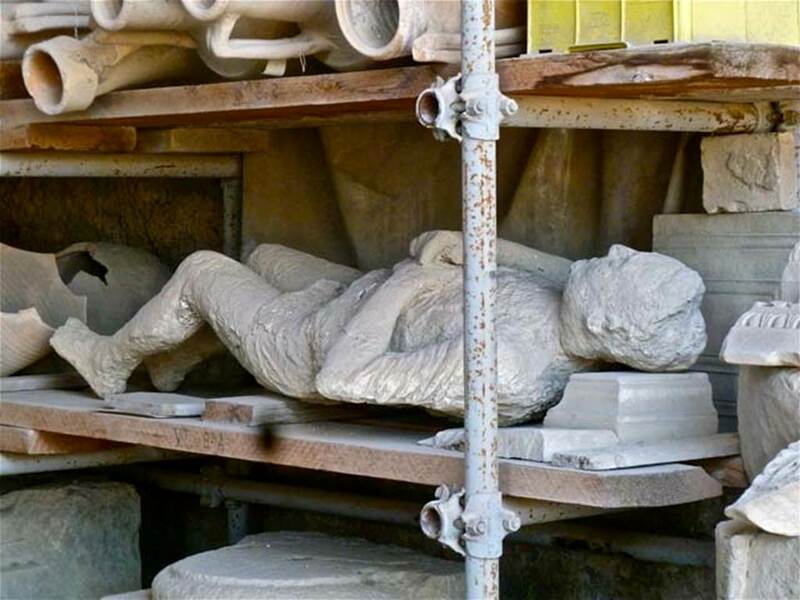 Plaster cast of a fugitive from the eruption, on display. He was found in 1889 just outside the Stabian Gate. Photo courtesy of Peter Woods. VII.7.29 Pompeii. April 2018. Items on display, including the arca or strong-box. Photo courtesy of Ian Lycett-King. VII.7.29 Pompeii. May 2011. 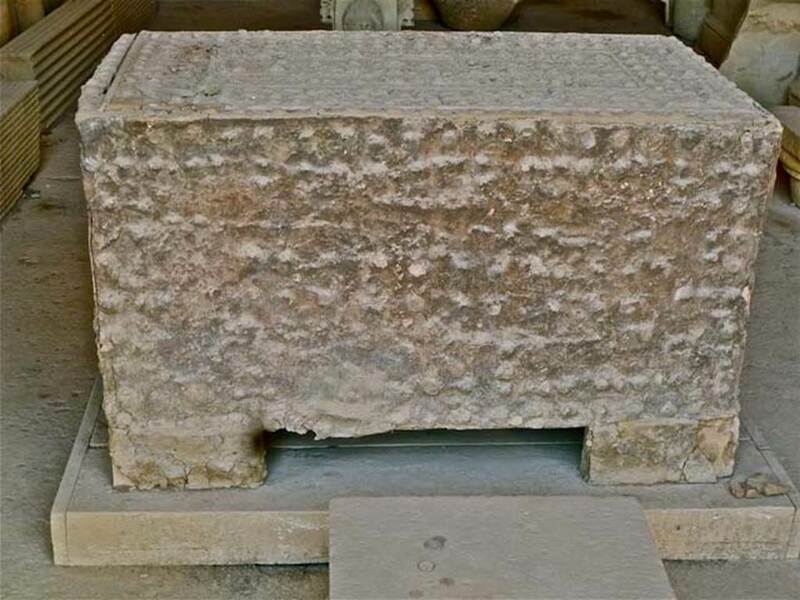 Arca or strong box, item in storage. Photo courtesy of Michael Binns. VII.7.29 Pompeii. May 2011. Items in storage. Photo courtesy of Michael Binns. VII.7.29 Pompeii. December 2006. Items in storage. Capitals from house doorways. 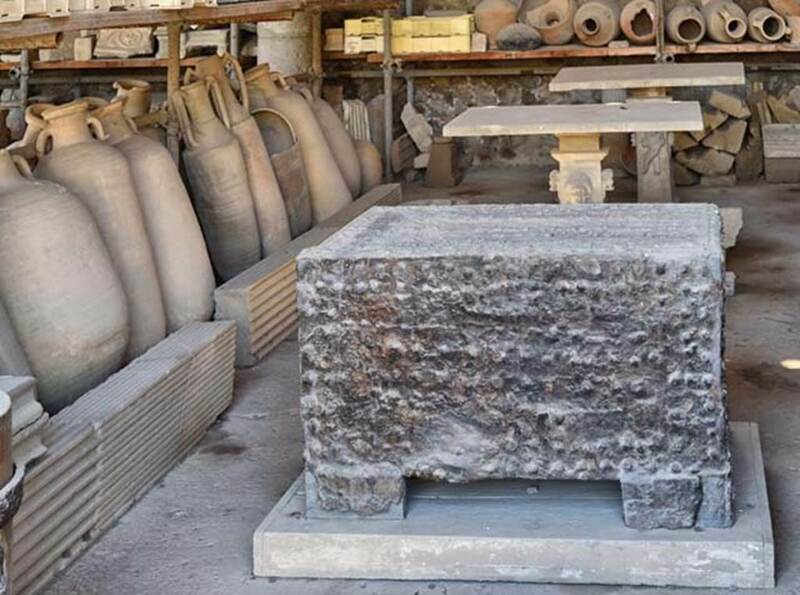 VII.7.29 House capitals being stored in Temple of Mercury. The lower capital is from the entrance of IX.1.20. 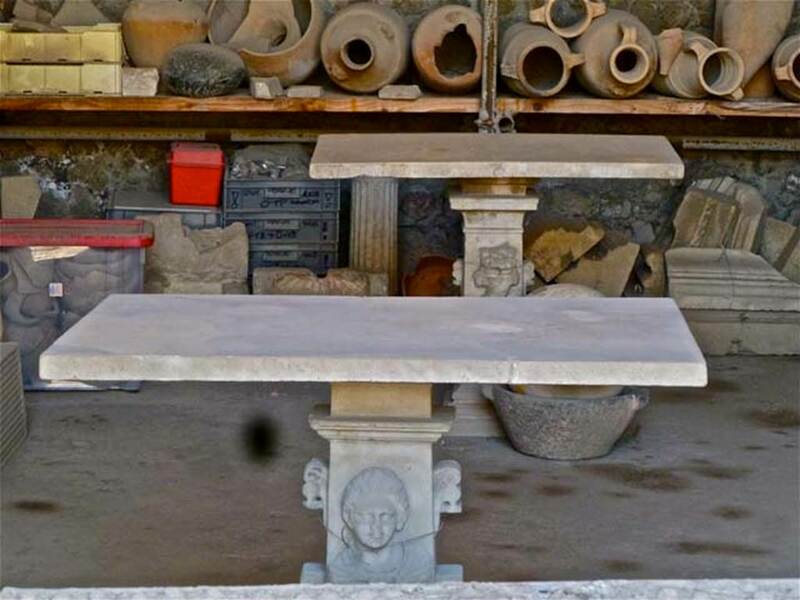 VII.7.29 Pompeii. December 2006. Item in storage. 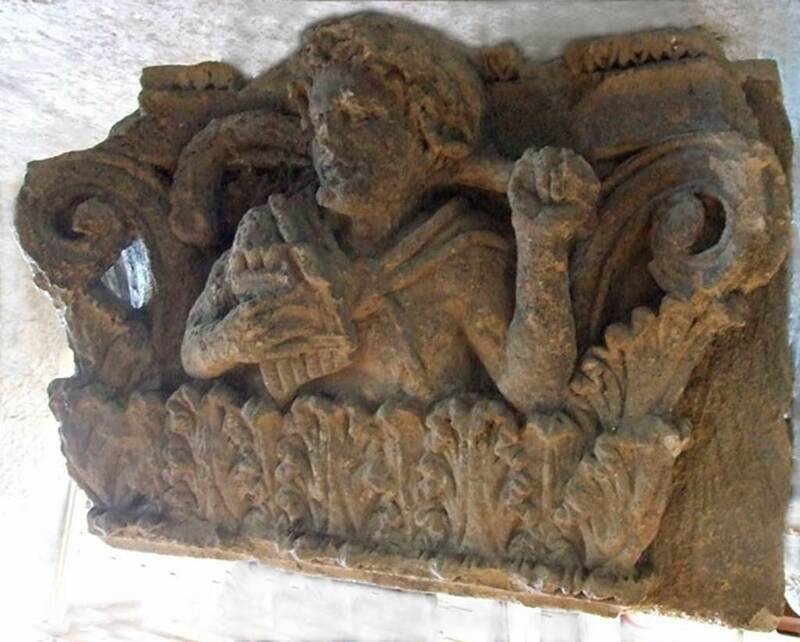 Capital with motifs of Dionysus from the entrance of IX.1.20. VII.7.29 Pompeii. December 2006. Items in storage. 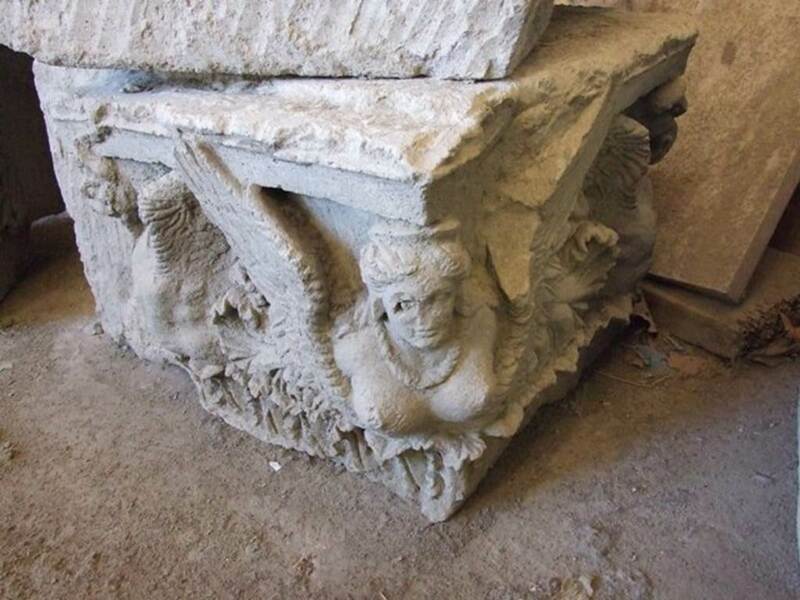 Capital from house doorway at V.1.7. VII.7.29 Pompeii. December 2007. 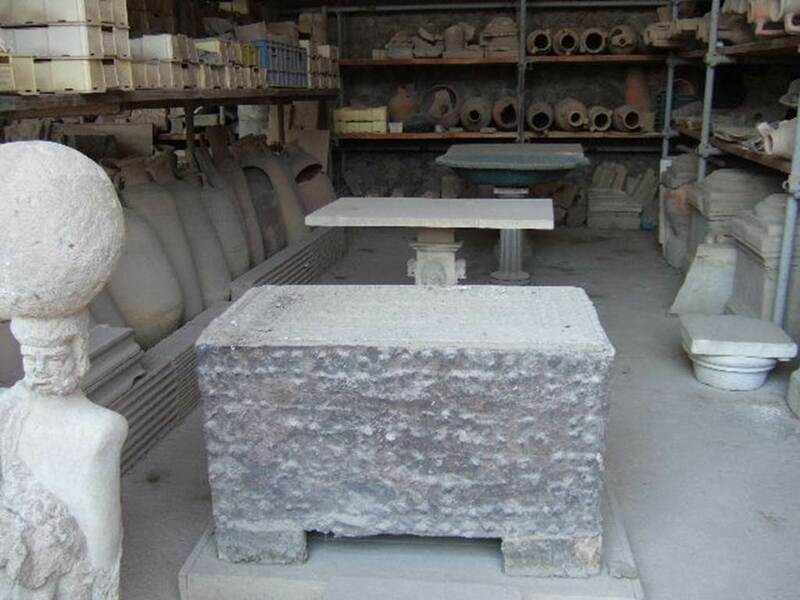 Remains of a capital from VII.4.51 on right, in storage. 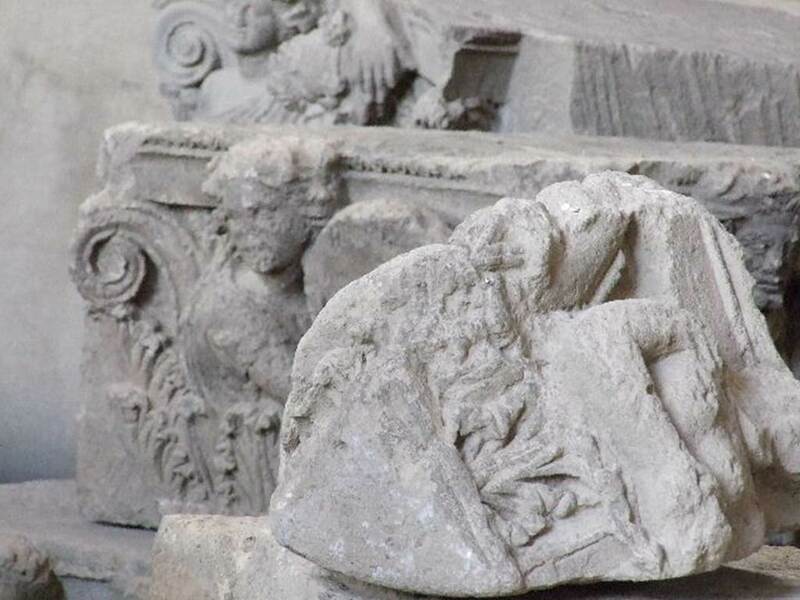 According to Spano, this damaged capital of Nocera tufa stone was found lying abandoned in a room of VII.4.59 the House of the Black Wall. 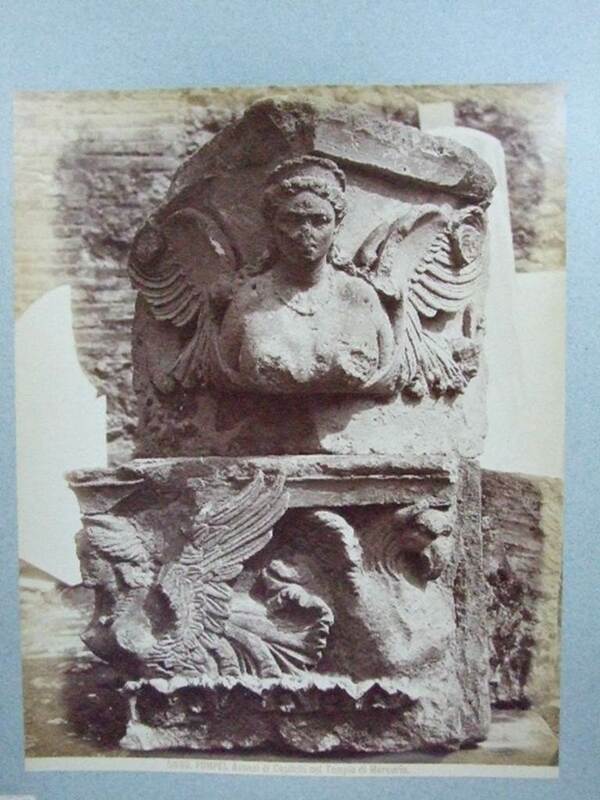 He suggested it may have been the capital from the right side of entrance VII.4.51 of the House of Ariadne. 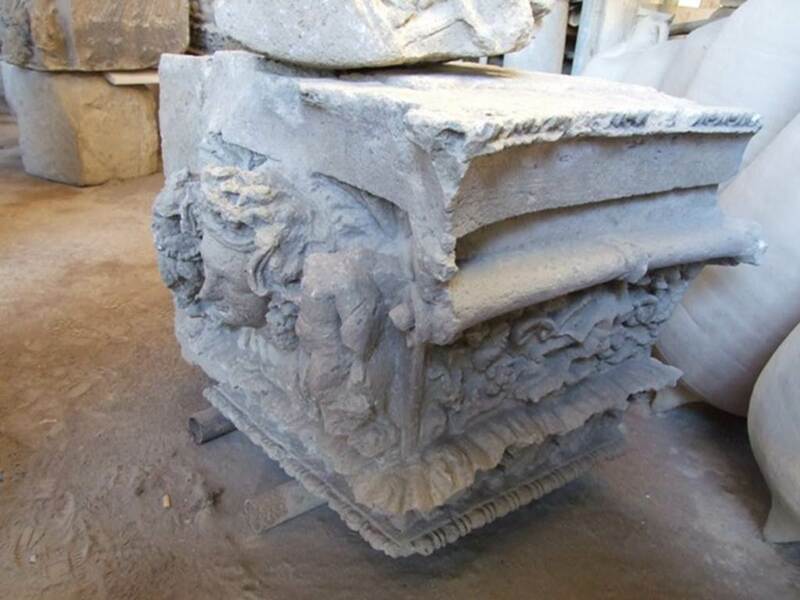 The capital stone was badly splintered and the details destroyed or damaged. 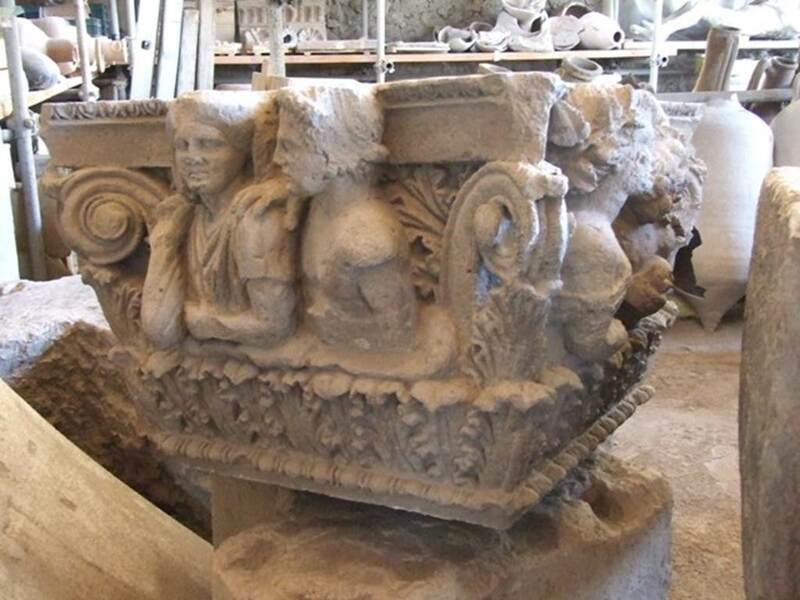 However, these few parts were sufficient to show the figures of this capital were similar to that of the other that is very much better conserved. These show similarities in the heads of a satyr and of a maenad in profile, the one near to the other. To the side of each group a small scroll and a line of leaves of vertical acanthuses below, both things characteristic of Pompeian figured capitals. See Notizie degli Scavi di Antichità, 1910, p.280 and p.282, fig. 12. VII.7.29 Pompeii. December 2007. 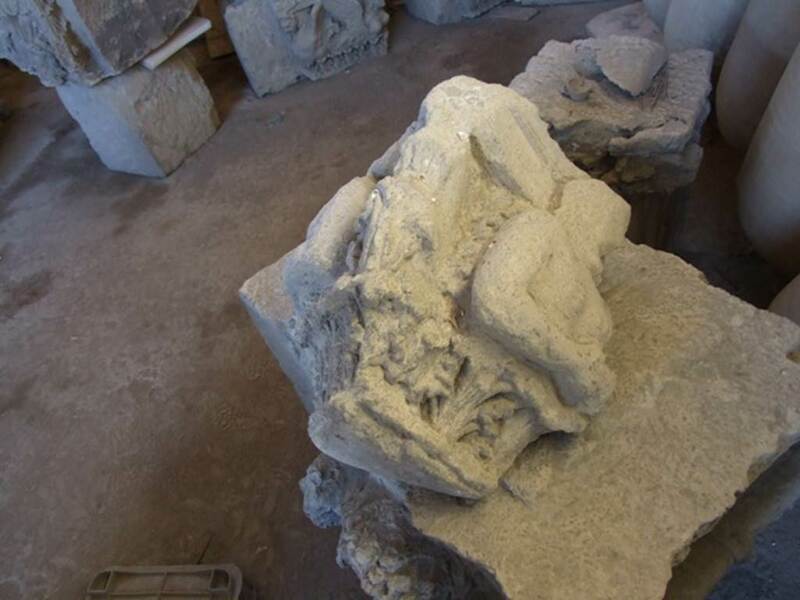 Remains of a capital from VII.4.51 in storage. 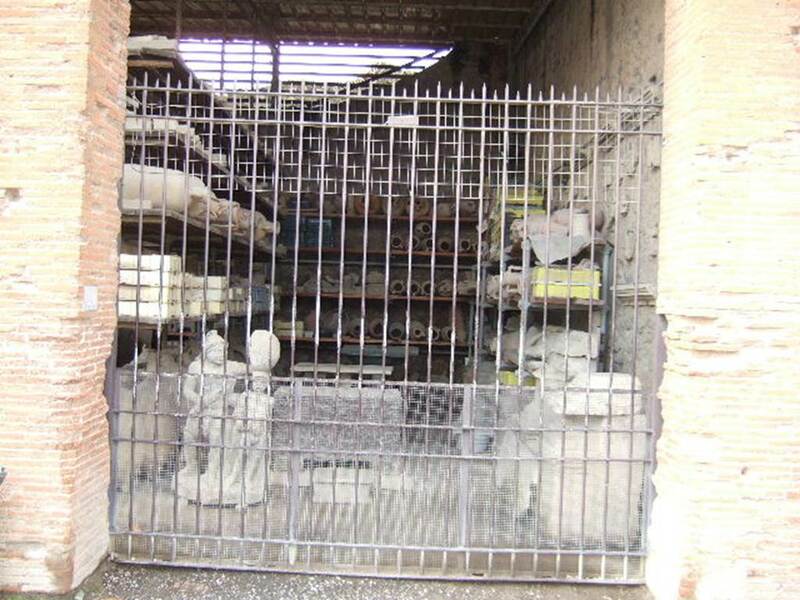 The above photo shows the side that would have been pointing onto the Via della Fortuna. VII.7.29 Pompeii. December 2006. 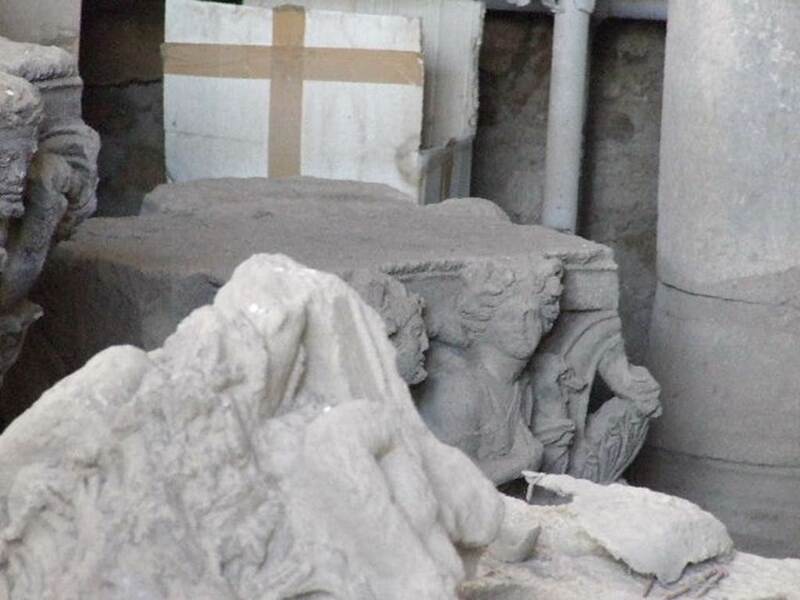 Remains of a capital from VII.4.51 on right, in storage. 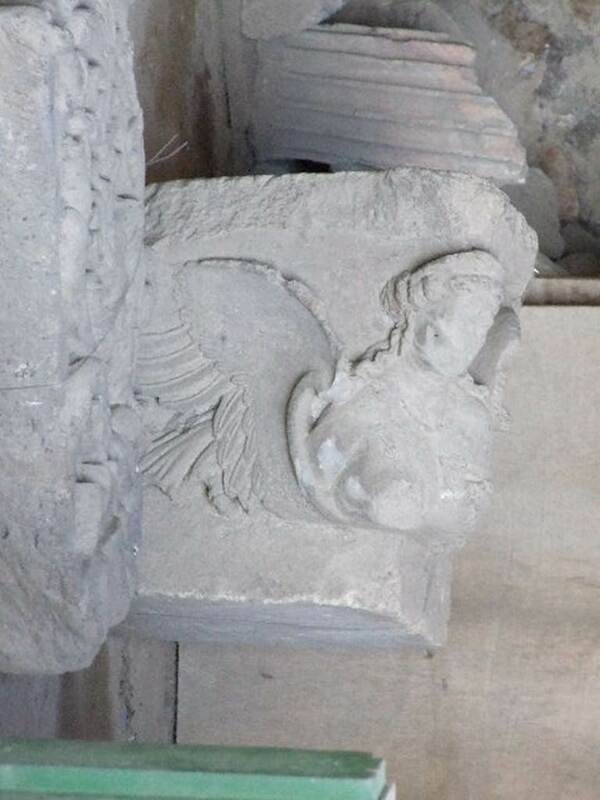 The above photo shows the front and the pointed corner with the remains of the scroll that separated the two sides. See Notizie degli Scavi di Antichità, 1910, p.282. VII.7.29 Pompeii. December 2006. Items in storage. 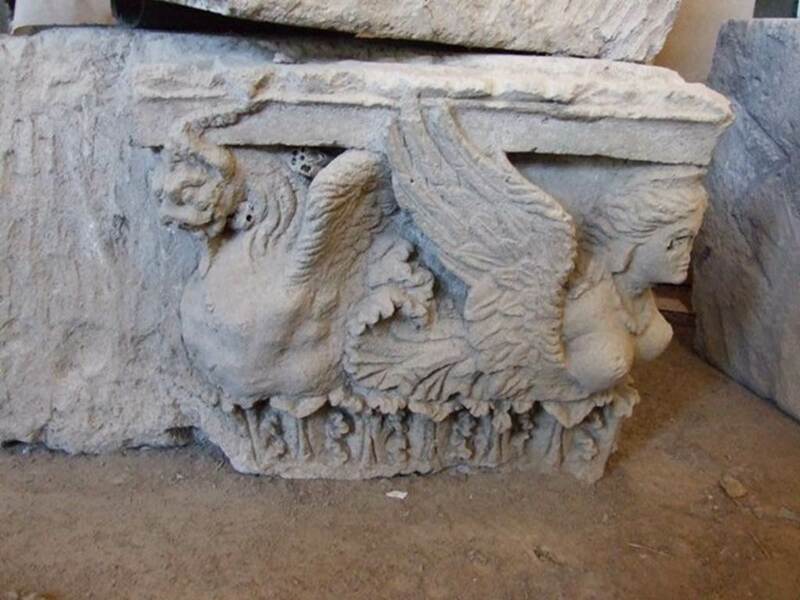 Rear capital is from doorway of VII.4.57. VII.7.29 Pompeii. December 2006. Item in storage. 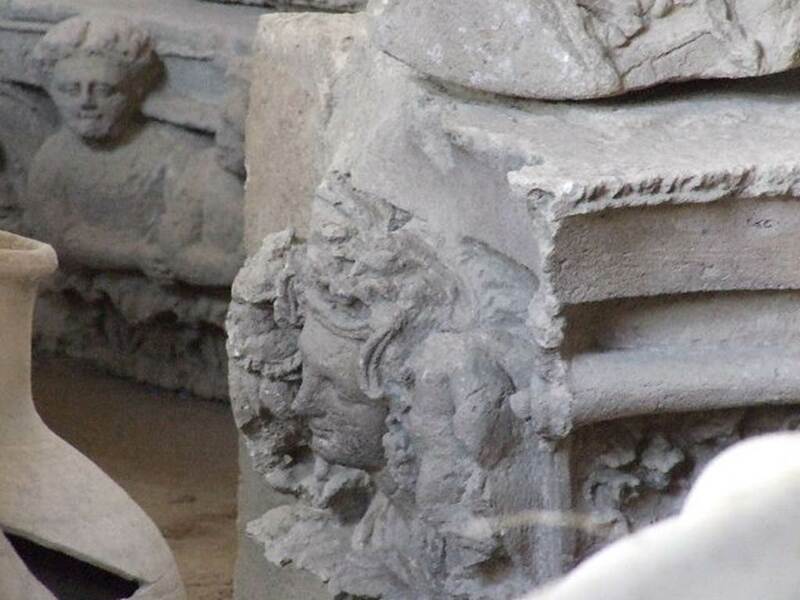 Capital from house doorway. VII.7.29 Pompeii. December 2006. Items in storage. 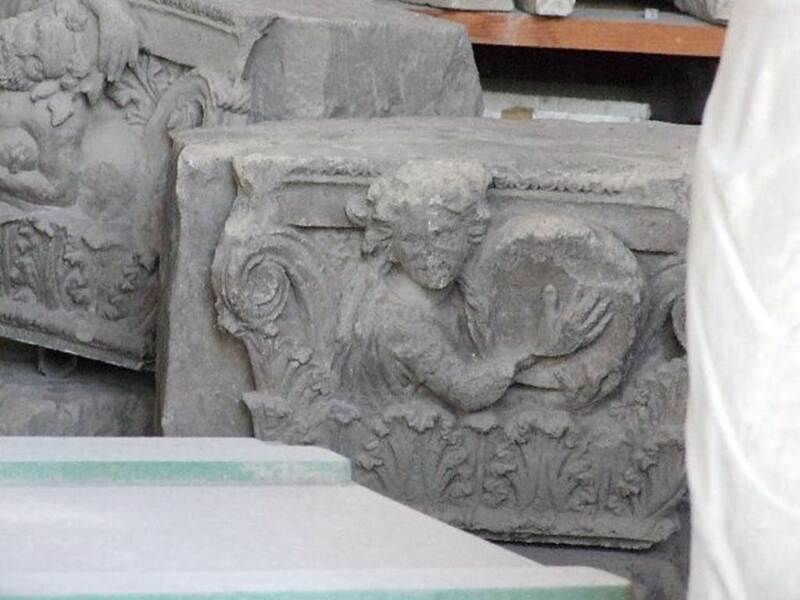 Capital is from doorway of VII.4.57. VII.7.29 Pompeii. December 2006. Items in storage. 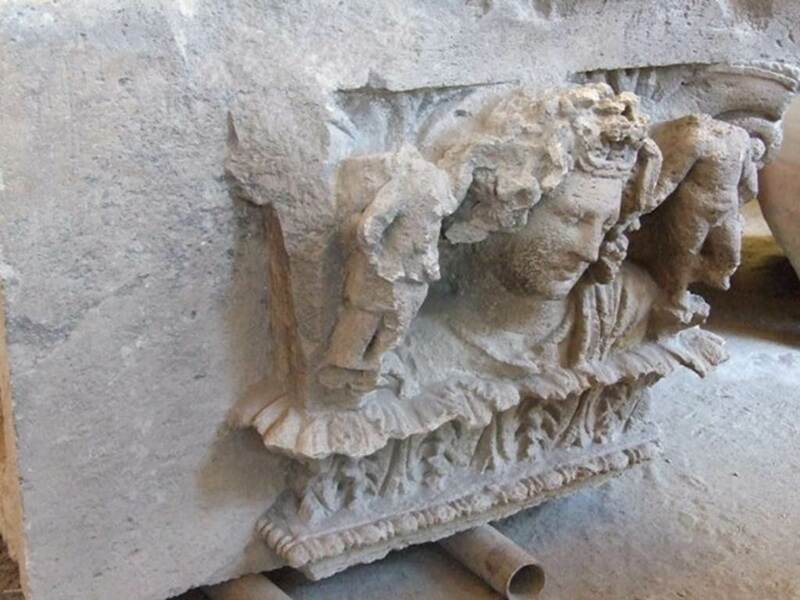 Capital at rear is from doorway of VII.4.57. 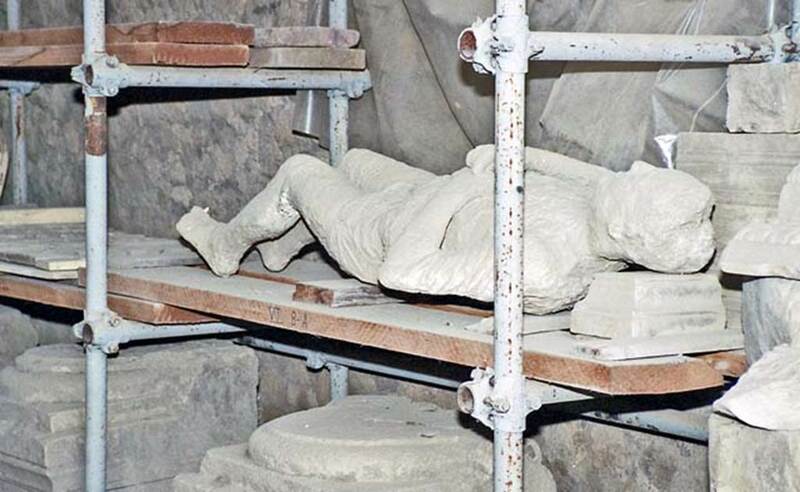 VII.7.29 Pompeii. December 2006. Items in storage. 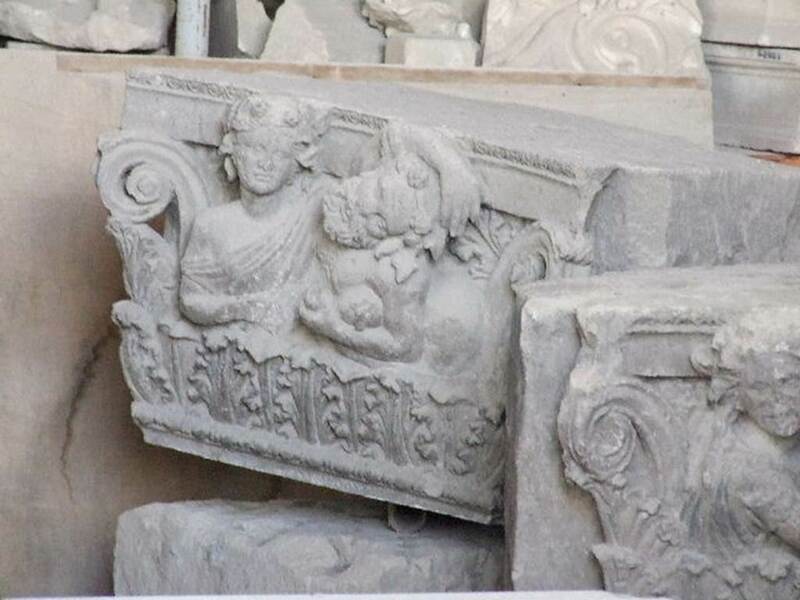 Capital at rear is from doorway of VII.4.51.